The life of a carer can be very difficult. For Sue Jenkins, whose 88-year-old mother Patricia needs round-the-clock care, it is very hard indeed. Two years ago, Patricia was diagnosed with dementia. An accident four years earlier broke her back and since then she has been disabled, doubly incontinent and using a wheelchair. "I have given up my life," says Sue. "I used to sail a lot. I used to do so many things. I'm a very outward-going person. But I take care of my mother. And that's it. "Love is something that drives you to give up those things. You'll give up anything." But she's struggling. She cares for her mother 24 hours a day. Even taking the time to speak to us was difficult. Her mother calls for her constantly. She can't spend very much time away from Sue before becoming agitated. There are professional carers who come to the house to help, but none lives with them full time and it seems a big part of what Sue does is to manage them. More than 20 professional carers have come and gone over the last few months because Patricia's behaviour can be so difficult. "She has a lot of challenging behaviour," says Sue. "Screaming, hitting out. It's horrible because dementia strips the person of their personality." Her eyes fill with tears as she talks. The physical exhaustion of a life with little sleep is obvious. But the emotional strain of watching her mother deteriorate is pushing her to breaking point. "I've lost my friend. My best friend. She's there - somewhere inside. But the person I dearly love and dearly want to talk to about so many things has left me already. "And the thought of losing her fills me with complete dread. Because my life is very much her," she says. I ask her what it's like when her mother hits her. "It's heartbreaking. It can make you feel useless. As she's saying that, it can make you want to run for the hills and just run into the night. "And there have been many occasions when I've wanted to run off, thinking I was a useless carer." Image caption The thought of losing her mum fills Sue with "complete dread"
It costs more than £2,800 a week to keep Patricia at home. That money is paid by local care services. But the authorities have twice tried to stop the money. Sue says it is an attempt to force her to put her mother in a home. That is something she is adamant she will never do. "I've seen what goes on in those places. It would kill her," she says. She feels hounded by the authorities and says it's taking valuable time away from her and her mother. She's says she is sometimes up through the night replying to emails, while still caring for her mother. "It's been absolutely devastating. The hours that have been stolen from me - email after email after email - chasing and phoning," she says. "The government wants to encourage people to stay in their own homes and nurse people in their own homes. And say there's support out there. But there isn't. "It's the most isolating situation anyone could find themselves in," she adds. There are more than 6 million people in the UK who look after sick or elderly relatives full time. Those numbers have been steadily increasing. But so have the pressures on people like Sue. 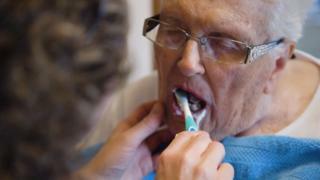 UK Homecare Association this month said 900 carers are quitting the industry every day. Government ministers say they will spend an extra £2bn on social care over three years. And earlier this week, Luke Hall, a Conservative MP on the Commons Work and Pensions Committee, said carers made "a huge contribution to society". "It's only right that we do everything we can to support the selfless work they do," he said. "That's why we already increased the rate of carer's allowance, meaning an additional £450 a year for carers since 2010." For Sue, her dedication to her mother has meant she has sacrificed her own happiness. Her husband left her six years ago when she decided to look after her mother. "You find that having any kind of relationship is very difficult. It would take a very understanding man to understand my situation." Life has become increasingly lonely for her. Yet she tries to remain positive. "It is worth it. There are occasional little laughs. Not often these days, but they're there. It's love. It's what you do. It's deep."